"They represent a dark period in my life." 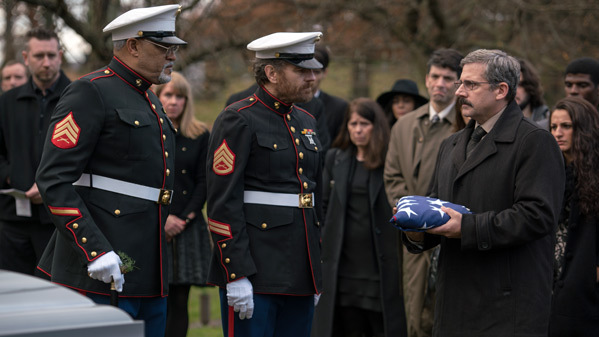 Amazon Studios has released the first official trailer for Richard Linklater's Last Flag Flying, a drama about war veterans set in 2003. This seems like an odd choice for Linklater's next film, but as always, I trust him since he's a very versatile filmmaker. The film is about three buddies, a former Navy Corps medic, an ex-Marine, and a Reverend, who reconnect on a trip for a funeral. They catch up on life while burying the son of the medic, a young Marine who was killed in the Iraq War. Starring Steve Carrell, Bryan Cranston, Laurence Fishburne, Yul Vazquez, and Cicely Tyson. This looks charming and there's some nice Linklater natural comedy that seems to make the camaraderie feel more authentic. This will premiere at the New York Film Festival this fall as the big Opening Night film. In 2003, 30 years after they served together in the Vietnam War, former Navy Corps medic Larry "Doc" Shepherd (Carell) re-unites with ex-Marine Sal Nealon (Cranston) and Reverend Richard Mueller (Fishburne) on a different type of mission: to bury Doc’s son, a young Marine killed in the Iraq War. Doc decides to forgo burial at Arlington Cemetery and, with the help of his old buddies, takes the casket on a bittersweet trip up the East Coast to his home in suburban New Hampshire. Along the way, Doc, Sal and Mueller reminisce and come to terms with shared memories of the war that continues to shape their lives. Last Flag Flying is directed by veteran filmmaker Richard Linklater, of many films Boyhood, Before Sunrise / Sunset / Midnight, Bernie, Me and Orson Welles, Fast Food Nation, School of Rock, Waking Life, Dazed and Confused, Slacker, and Everybody Wants Some previously. The screenplay is written by Richard Linklater & Darryl Ponicsan. Based on the novel by Darryl Ponicsan. This premieres at the New York Film Festival. Amazon Studios will open Last Flag Flying in select theaters starting November 3rd. Thoughts?